Here we are the first notes for the blog after the wettest and dullest summer ever. Despite the lack of sunshine, on video you don’t need it, I have amassed 35 hours of wildlife so far this year. If this had been cine film it would have cost over £3,500 instead it has cost £70! – I should have changed to video years ago! Ten weeks of our year has been on Islay, we still have two more weeks to come next month. We should then have enough video to prepare a major presentation of the islands wildlife. Normally at this time of year in the Pennines not much is available to film. However, with the current weather – the best of the Summer, I have been very active. 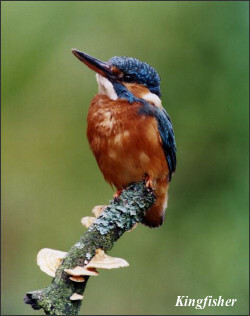 So far more than twenty hours has been spent trying to film Kingfishers on a local pond. One good session produced 25 minutes of one bird which was very pleasing after many long hours under a camouflage cloth producing nothing. I have also spent some hours on my local Golf Course trying to bait foxes with dog meat. I put the food out day after day but nothing eats it, then I left checking it for a few days and when I went back it had all gone and the foxes had left their droppings!! I will have to hope for a change of luck and continue to persevere. The most pleasing event this month has been the appearance of a Barn Owl locally. Much time has been spent at dusk observing this male as he goes to hunt into the night – none has bred around here since 1972 and it would be good if he found a mate! I have also filmed three pairs of Swallows still feeding young in their nest in September. whether these young make it all the way to South Africa for Winter is highly unlikely. That’s all for now it wont be long before the Winter thrushes arrive and hopefully this Winter some Waxwings – my favourite bird. I have been interested in wildlife, especially birds, since I was 4 years old, when I was shown the contents of a Dunnock’s nest by my father. As I grew older I maintained a diary of my wildlife sightings which now intend to share with you on this blog. There have been many trials and tribulations being a wildlife photographer and I will tell you some of my stories in the coming weeks.